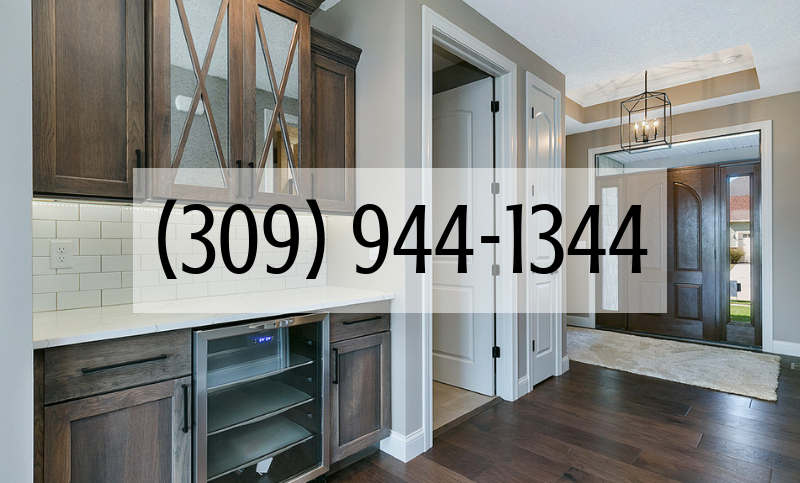 We had recently remodeled a nearby bathroom for this customer that is just around the corner. 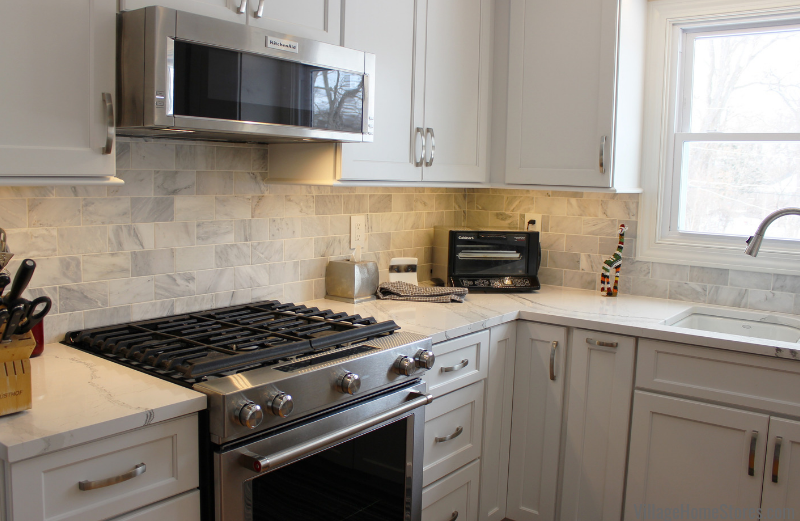 This Arabescato Carrara Marble subway tile is a material choice that carries over from that bath remodel project into the kitchen. We love the way the natural stone brings a unique mix of grays and even a subtle blue tint to the kitchen space. 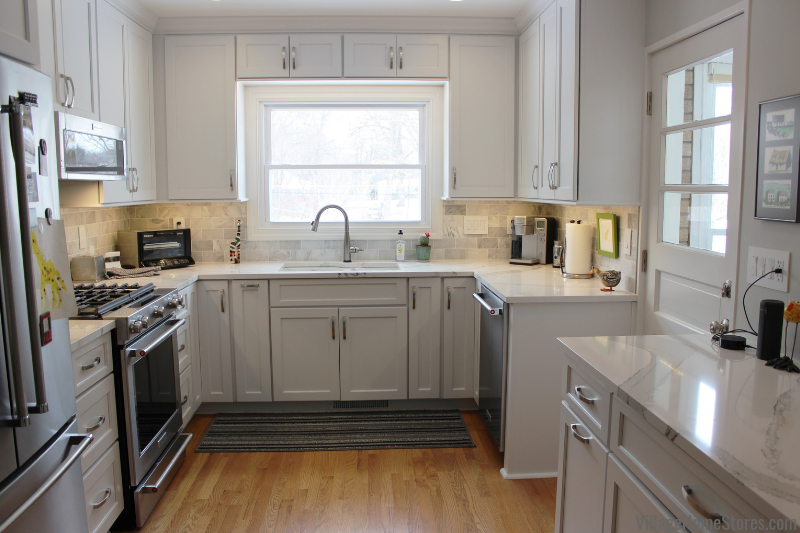 This blend of bright whites and subtle grays are what allows the light to bounce around this bright kitchen. 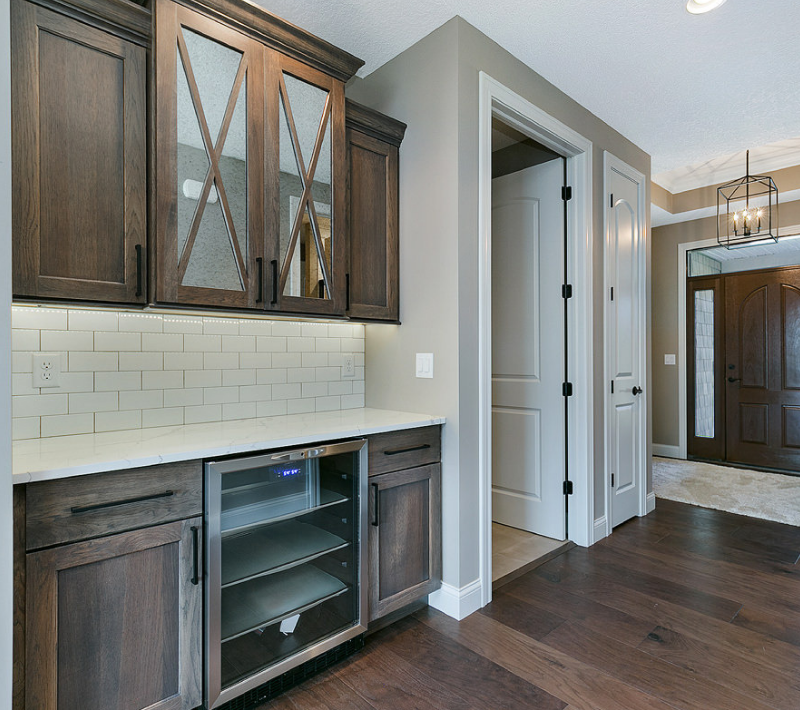 With soffits removed, the new cabinetry can stretch all the way to the ceiling in a flat-panel door named “Prairie” by our Koch Classic Cabinetry line. The cabinets have been finished with a White paint. The U-shaped kitchen layout has only had one appliance location change, moving the dishwasher closer to the sink. You can see the original location for the dishwasher was clear across the room (see below). 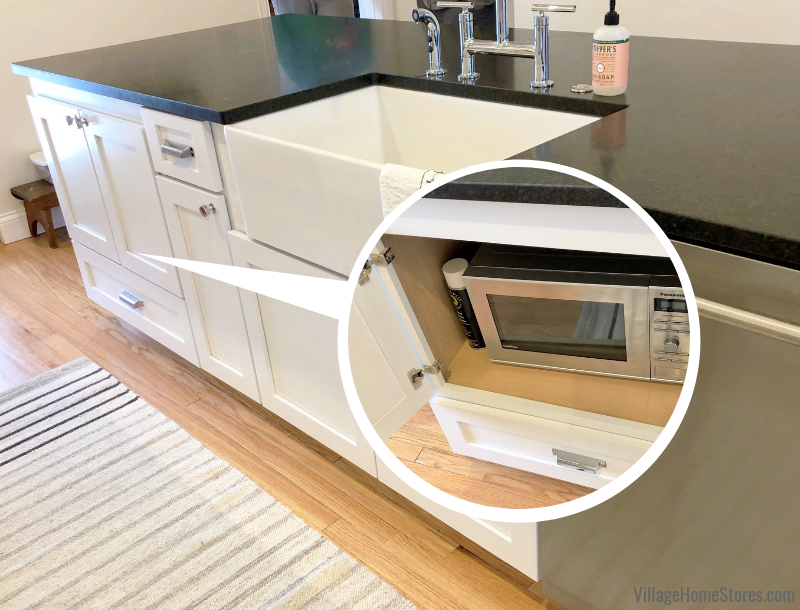 Not only were we able to move the dishwasher to a more useful location, we were even able to squeeze a lazy susan cabinet in the corner instead of the original “blind corner” cabinet. 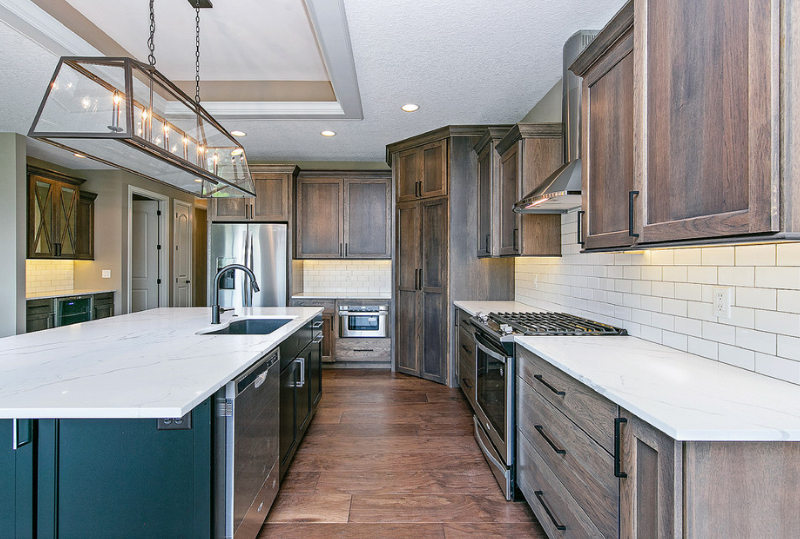 We just love how bright and clean this new kitchen looks with the materials selected. 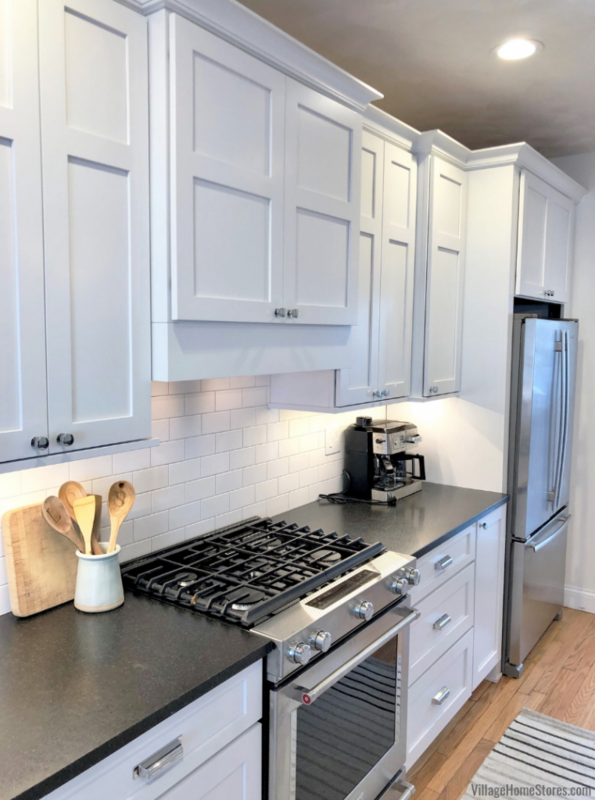 Flat panel white kitchen cabinetry may sound like a basic choice, but it is truly the best transitional platform you can give yourself for a kitchen or bathroom space. 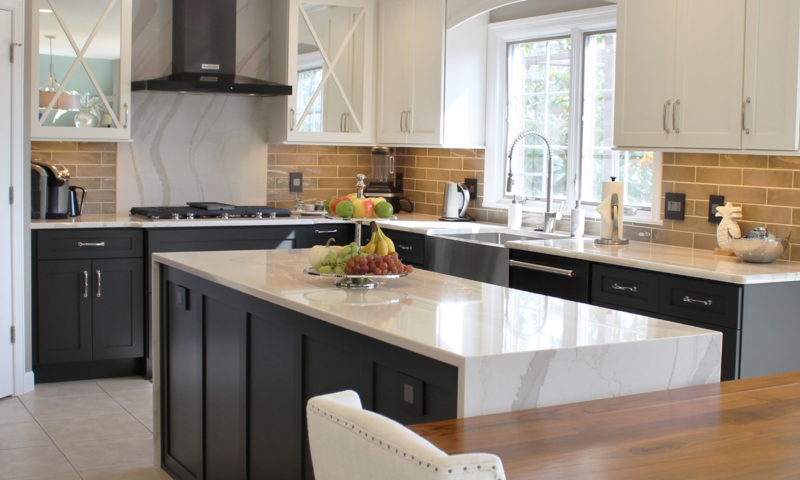 White cabinetry can be styled so many ways and to suit so many tastes. In this home, the white cabinets have an almost art gallery effect on the curated framed artwork and decor items allowing them to pop. This KitchenAid dishwasher is just part of an entire package of Stainless Steel appliances that are truly built for those who love the cooking process. Recognize this gas range? 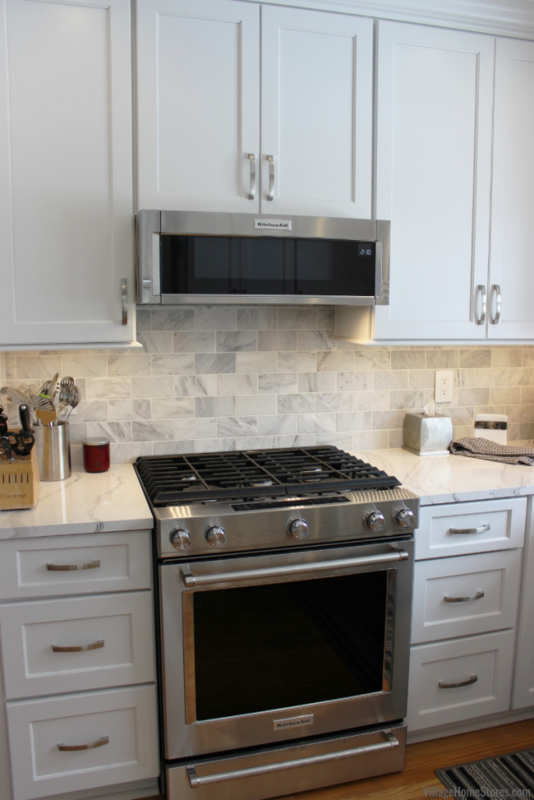 That may be because it was also the gas range model from our last kitchen featured here on the blog. 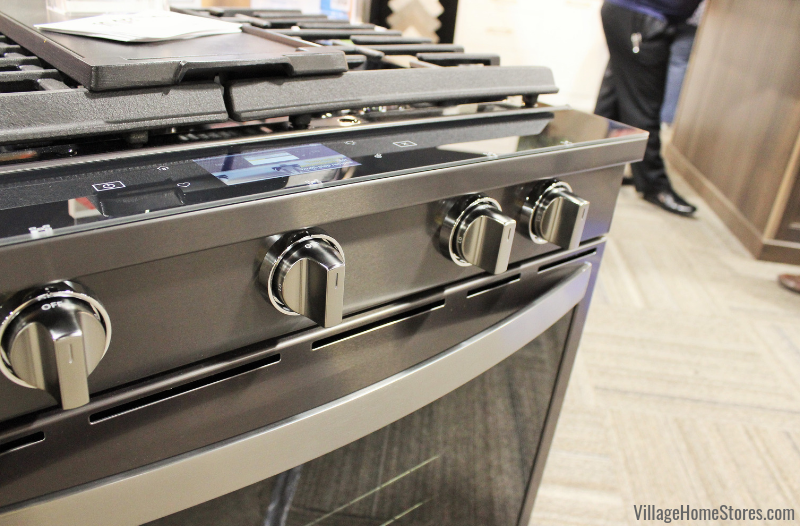 This 30″ wide front-control gas range includes convection features and 5 burners on top. 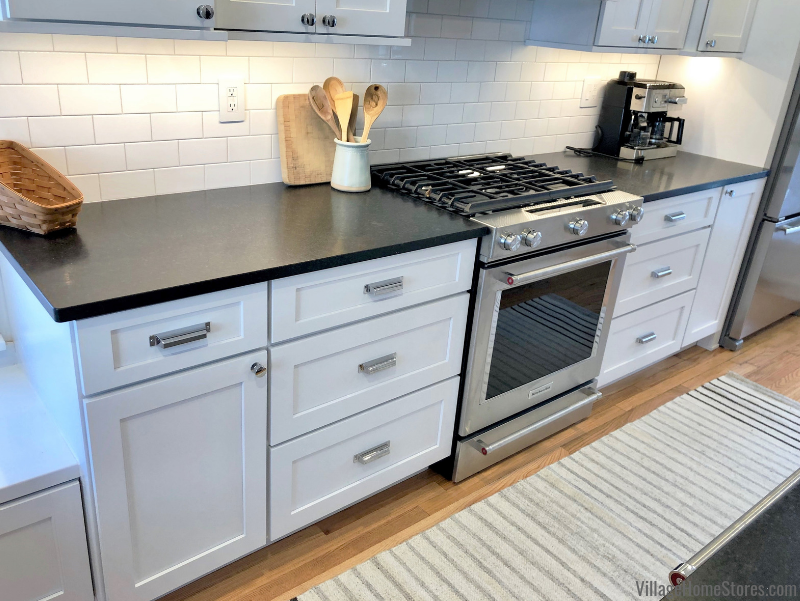 We love the new design of KitchenAid’s front-control ranges because they give you the look of a custom, slide-in range but they fit into a standard 30″ wide opening. Yes! 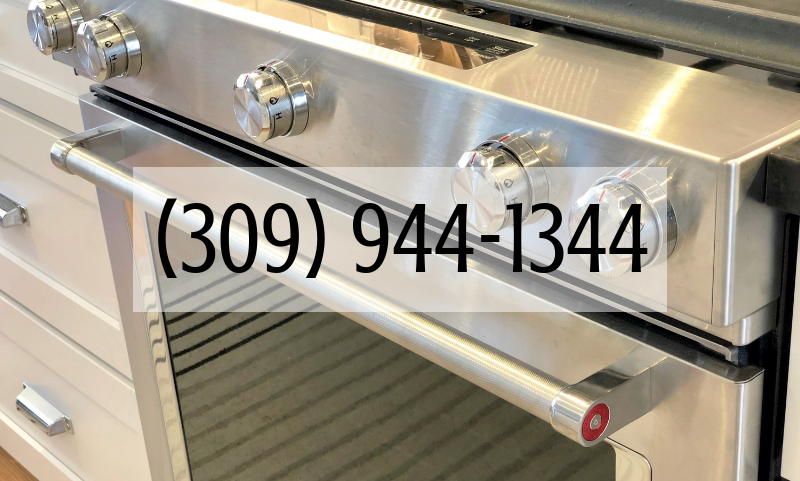 That means if you have a standard gas range right now, this KSGG700ESS will slide right into that opening and give you a clean and professional look. But did you notice that microwave hood was a little shorter than normal? 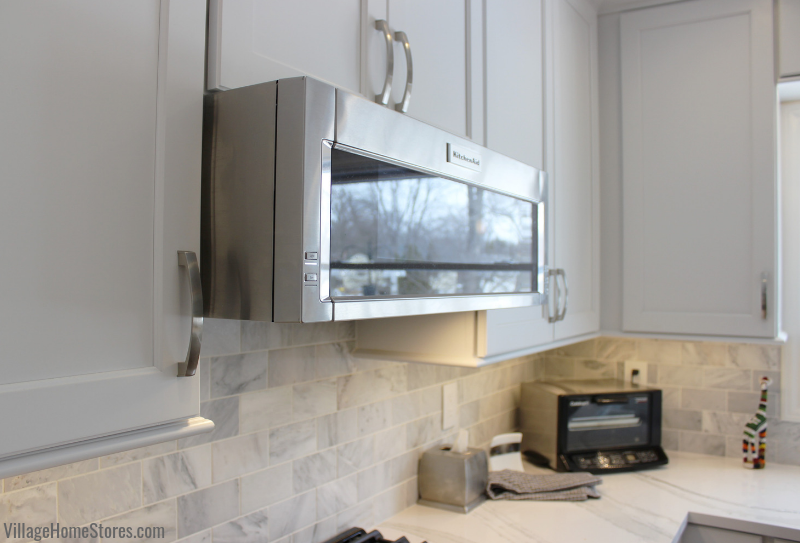 These microwave hoods are a welcome addition to an existing kitchen just in need of a new functional look, but also looks right at home in this new design. 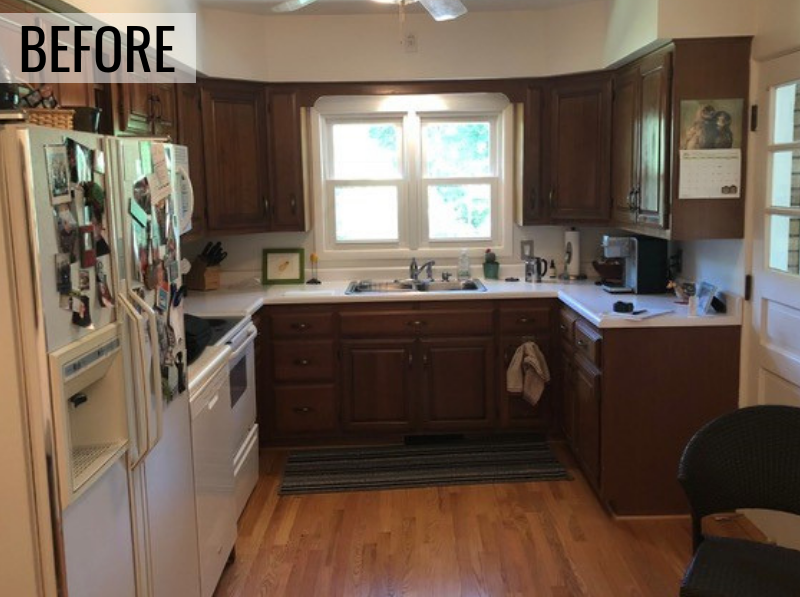 This Moline, IL kitchen was remodeled from start to finish by Village Home Stores. What does that mean? That means that the client teamed up with us and our Complete Project Management team to organize every step of the process with them. 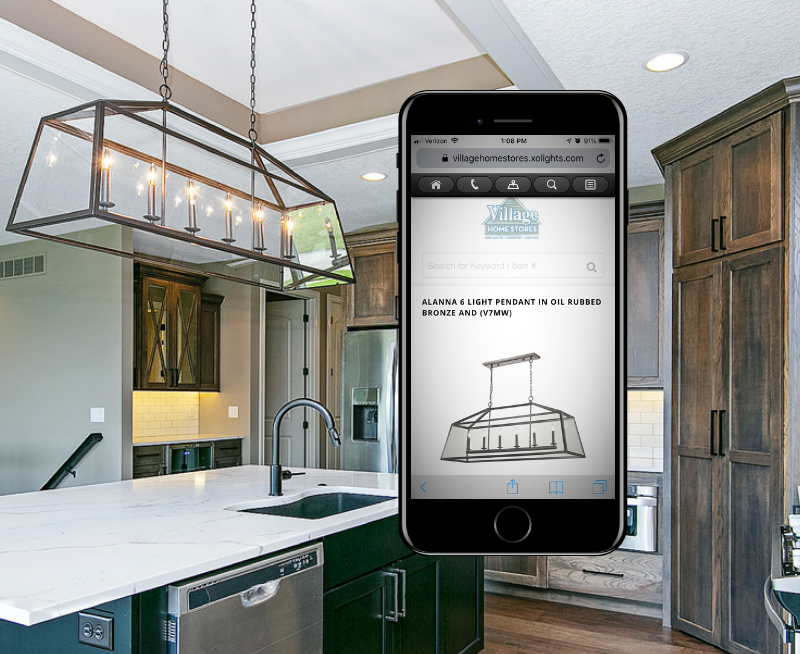 All kitchen designs with us begin with the same initial consult meeting in-store. From there, our project management clients are given a whole different checklist of events than our DIY clients. One of the key moments in this Project Management remodel process is the contractor meeting during the estimating process. We arrange a meeting in your home with all of the crews who will be bidding the work. We then discuss what needs to be estimated for the project and from there we can not only present you with a more accurate total project number, we can also spell out all of your work included in an inclusion sheet. 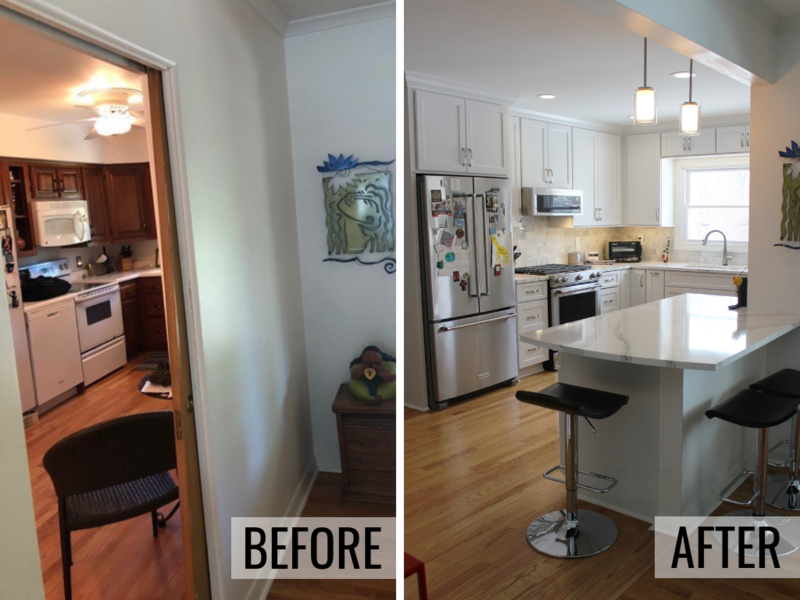 In this Quad Cities home we removed a section of a wall dividing the kitchen and dining room spaces (see before and after below). With that work to be done (plus electrical, tile, carpentry, and plumbing work) we had a full schedule of events to get us to the finish line. That meant we needed to schedule multiple crews for the best use of time and in the right order to get this kitchen done by the Holidays. We did! 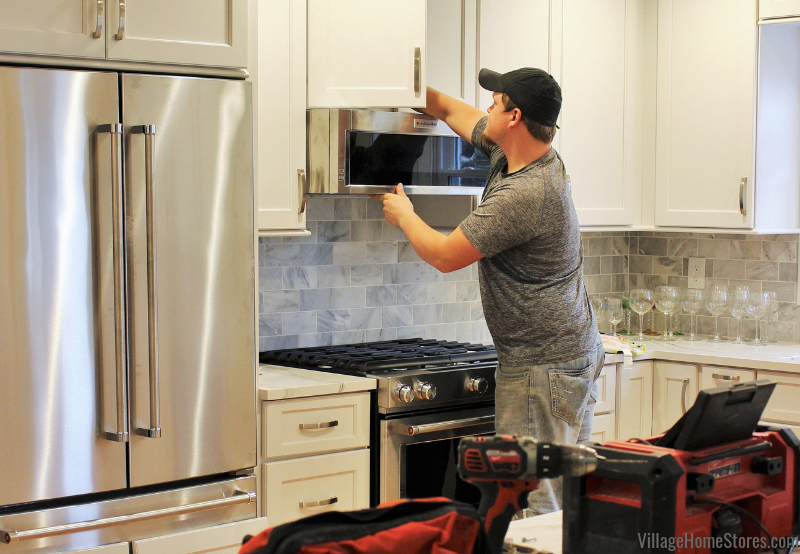 We know your time is valuable and nobody enjoys living in a home during the remodel process so we try and keep to using reliable and efficient crews who are used to working together and can keep us all on track. If all that sounds overwhelming, don’t worry! Village Home Stores will do all of that schedule work for you. We also transformed another wall in the kitchen design. 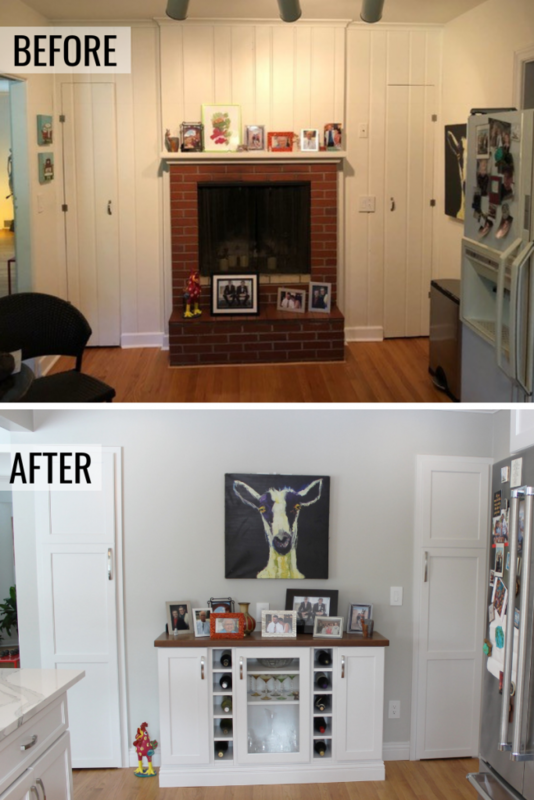 We removed a fireplace from the end of the original kitchen and gave that wall a whole new function. 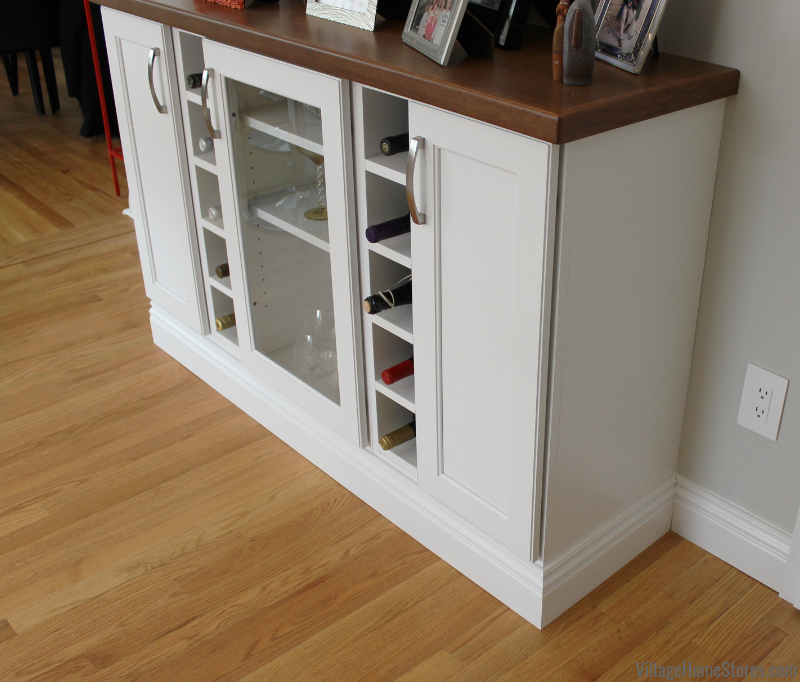 Now there is a gorgeous wine sideboard cabinet centered on the space and we have added pantry fronts to match the kitchen cabinet doors. Each of those tall doors open to deep, shelved storage and a broom/cleaning closet area. We love how this end of the kitchen has now become a part of the kitchen design itself. We included a glass door cabinet at the center of the space and two wine cubby base cabinets for storage and decoration. 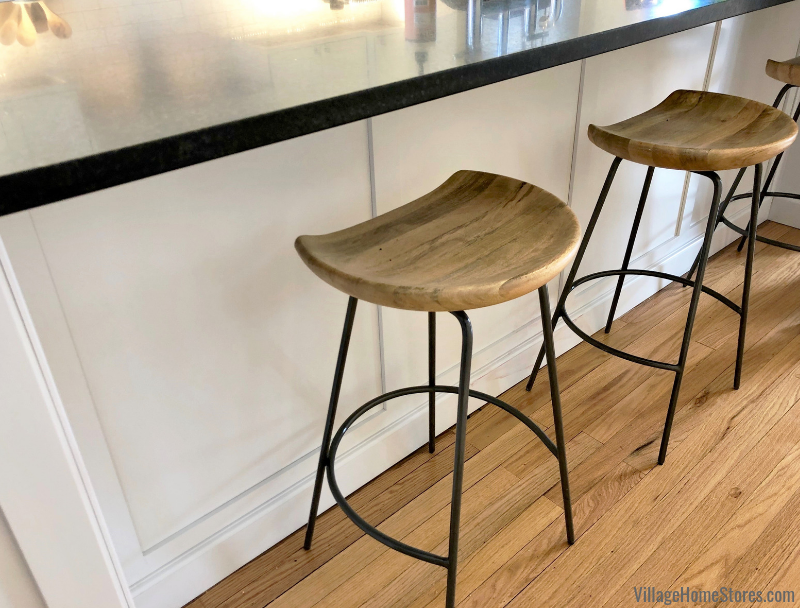 Wood countertops can also be ordered from Village Home Stores. This one came from the same shop that built our cabinetry. 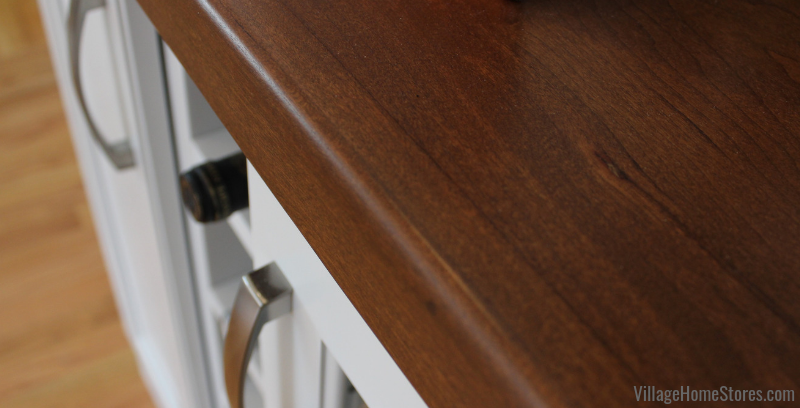 By using a wood top on a sideboard element like this, your result is a more built-in and furniture look for the section of cabinetry. Have a nearby dining room or home office that could use some cabinetry design? Don’t hesitate to contact Village. We can save you a lot of time shopping for the right piece of furniture and instead build you the perfect one! On the subject of countertop surfaces, allow is to introduce you to this marble-look engineered quartz surface by Cambria Quartz. This is the Brittanicca design in a standard eased edge. 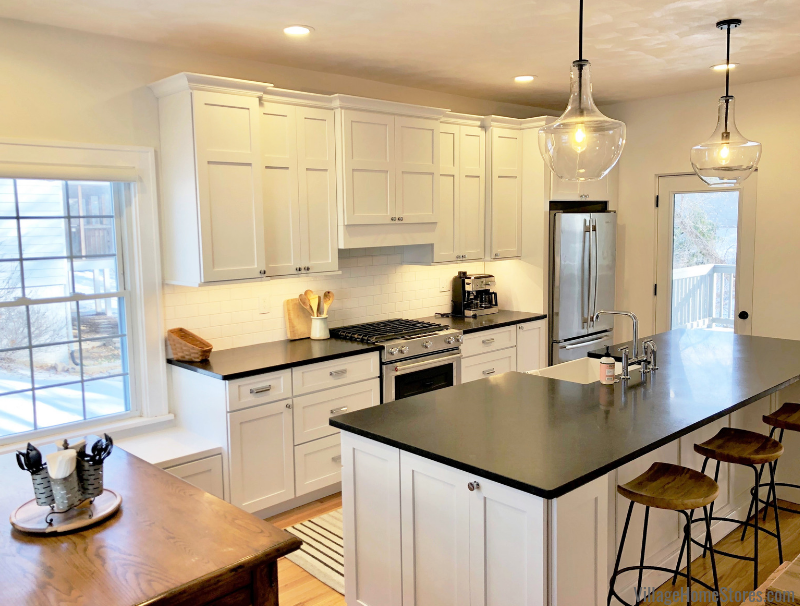 The large-format marble pattern gives you the look and character of a marble surface with the no-hassle and worry-free piece of mind quartz surfaces offer. A perfect compliment to the marble look Brittanicca quartz counters, the true marble tile selected for the kitchen backsplash is stunning. Arabescato Carrara has subtle variations from tile to tile and it is just enough to bring natural stone character to the space. 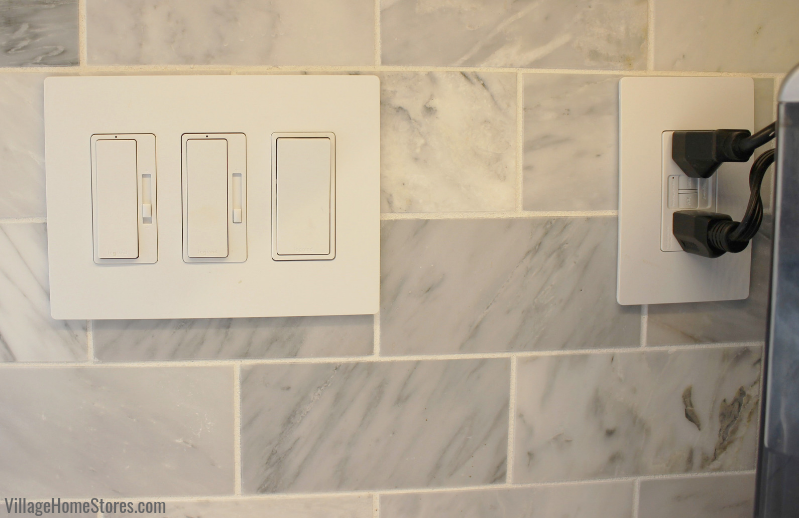 We also installed our Radiant Collection series of switches and outlets throughout the remodeled kitchen design. 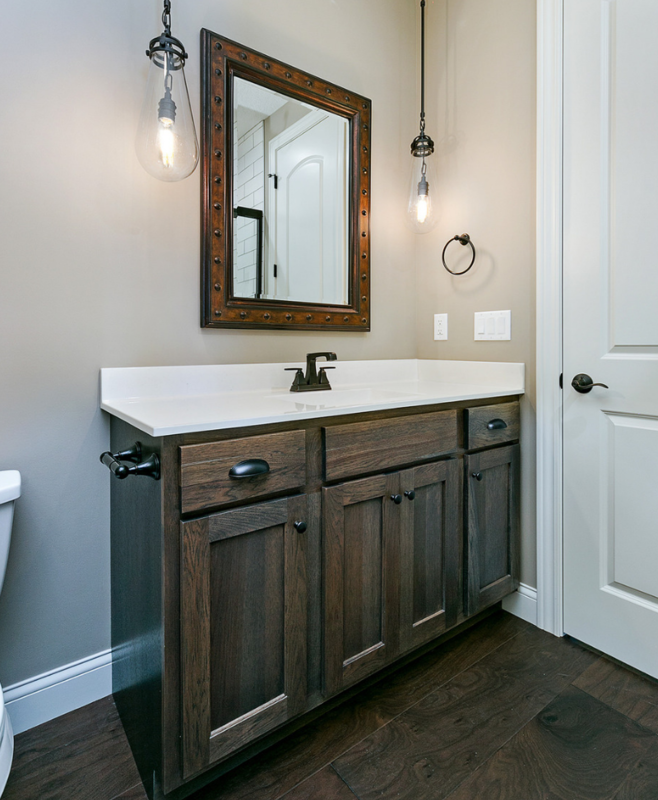 White plates and fixtures were a great choice to seamlessly blend in with the overall look. Notice one of our favorite features of this series… no visible screws on the backplates! 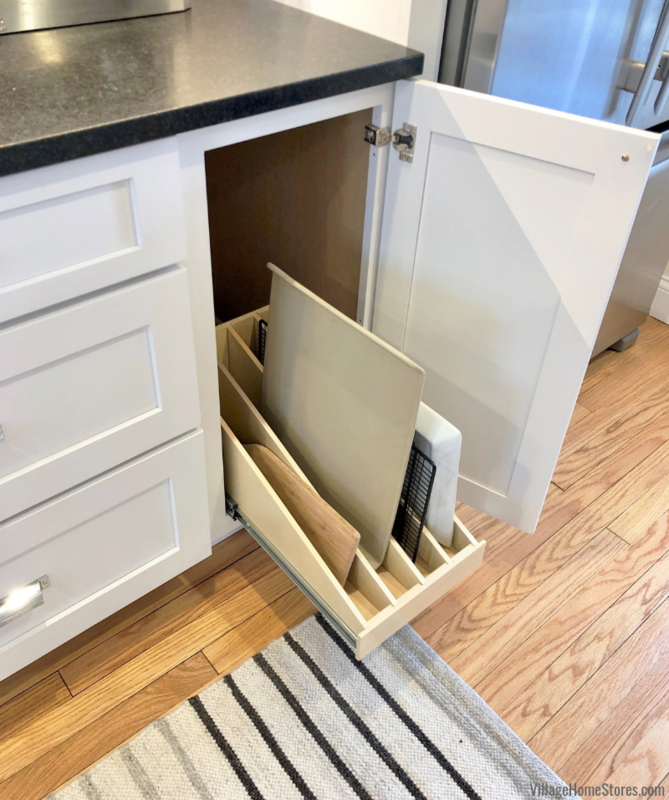 Of course we added creative storage solutions anywhere we could for this customer in their cabinetry. 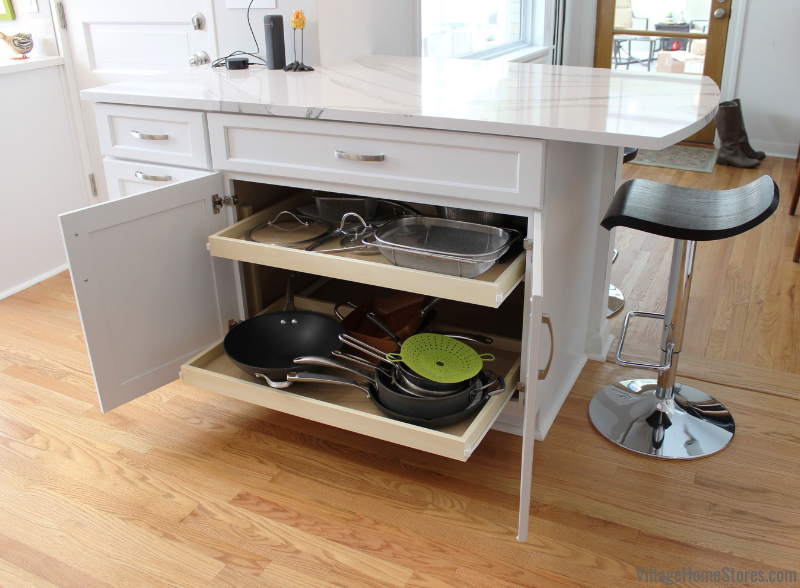 Pull-out cabinets, tray dividers, sliding shelves and more. 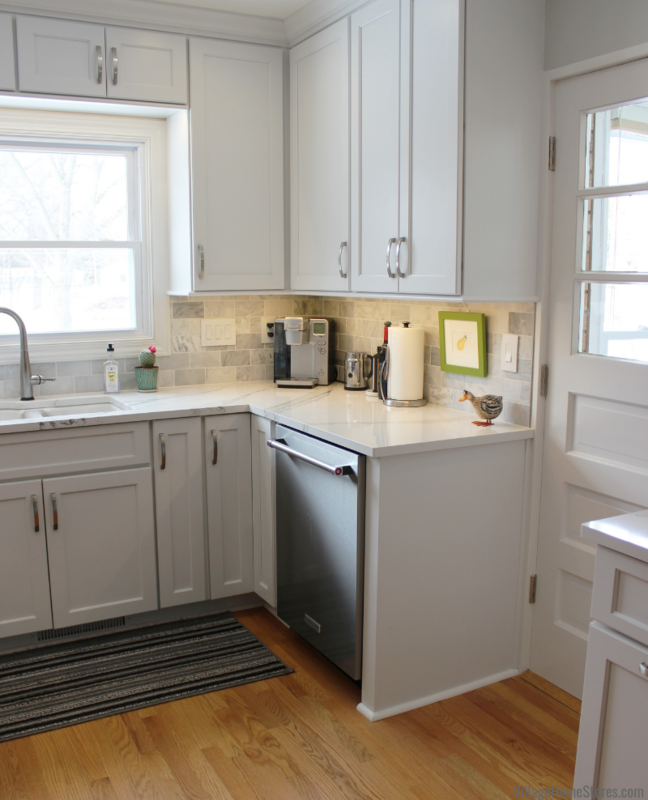 In remodel situations like these, you many times only have a handful of cabinets to work with in a design. You must make the most of that space and our experts are here to help you do that. 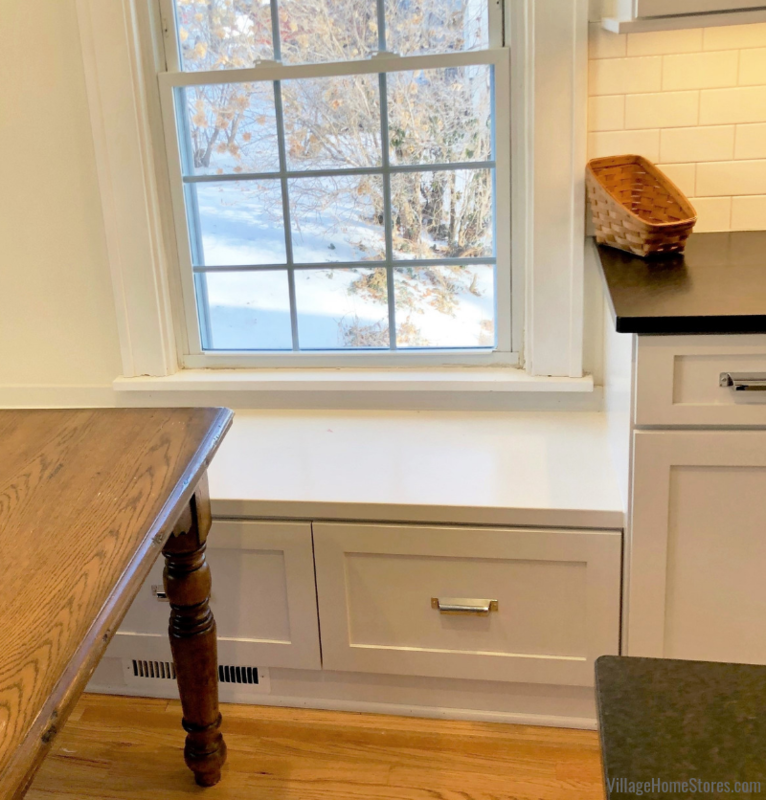 With the dividing wall partially removed, we were able to install a new peninsula area to add a lot of cabinet storage and a stunning arched countertop surface with an overhang for casual seating. If you want to see the full album of photos from this remodel project visit our Houzz portfolio of projects. 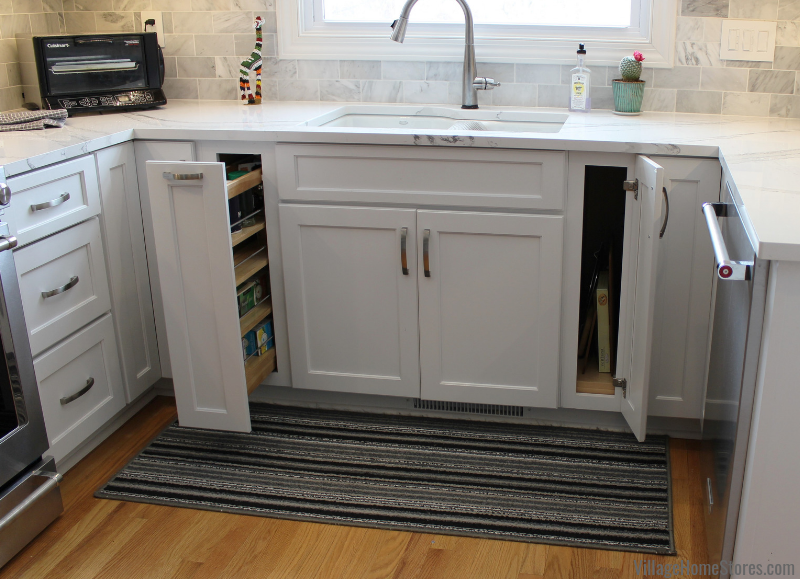 Tap here to see the full album including more before images and specialty storage cabinets. 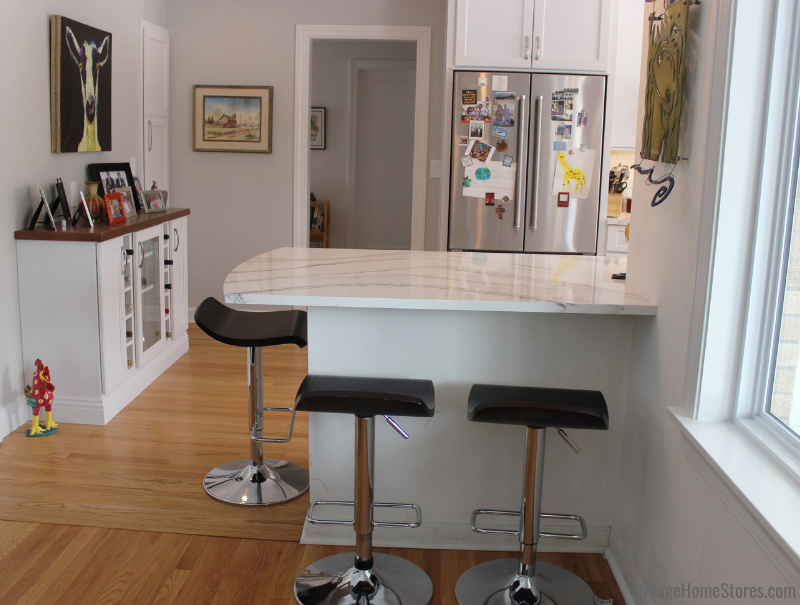 There you can save these photos to your own ideabooks to have ready when you begin discussing your own kitchen project with our team. How fun is that?! Do you have questions about our remodel process? We have answers! Your first step is to just reach out to our team. 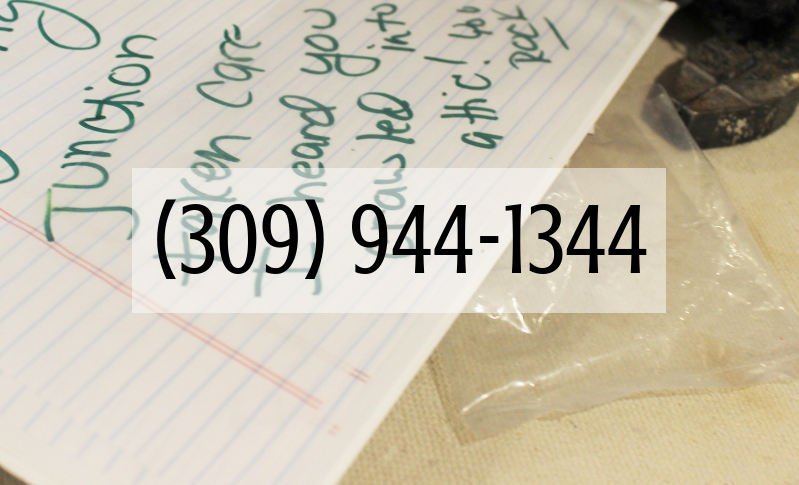 You can contact us by phone at 309 944 1344 or by tapping here to submit an inquiry on our website. A member of our design team is excited to connect with you and hear about what you are working on. 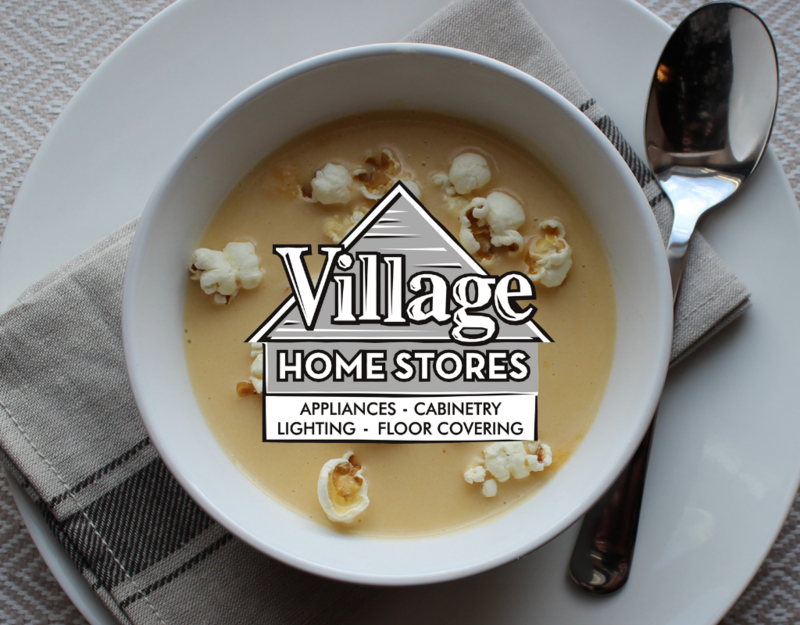 Last week at Village Home Stores we held our second annual Staff Soup Cook-Off and almost immediately when we started posting photos from it to our social media we had messages coming in with requests for recipes. We had many entries this year and once again, each was different from the next! It was pretty much the best work potluck on a snowy February day EVER! 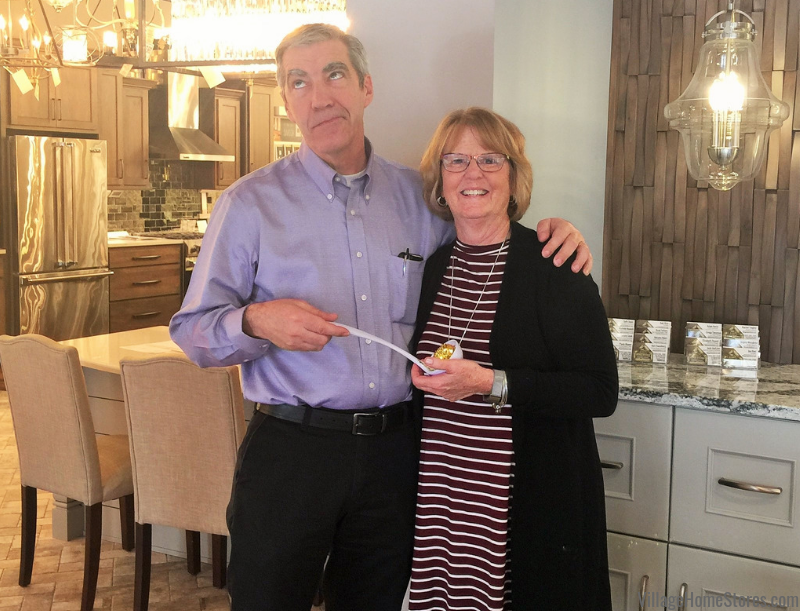 Before we get to all of the delicious recipes we have to of course give a proper shoutout to this year’s winner of the coveted “Golden Ladle” ::: drumroll ::: congratulations to MaryBeth Farber for her winning Baked Potato Soup!!! Of course she was very excited to beat last year’s winner Gregg Swanson (he looks thrilled doesn’t he). The winning recipe was MaryBeth’s Baked Potato Soup! She also staged up her serving station with decorations and had a whole buffet of toppings for the soup. 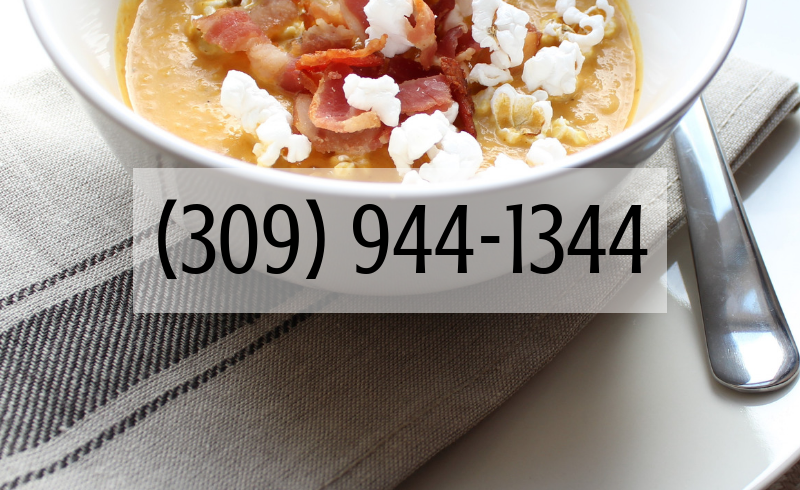 If you are looking to find a delicious winter soup to feed the masses this is your new favorite! 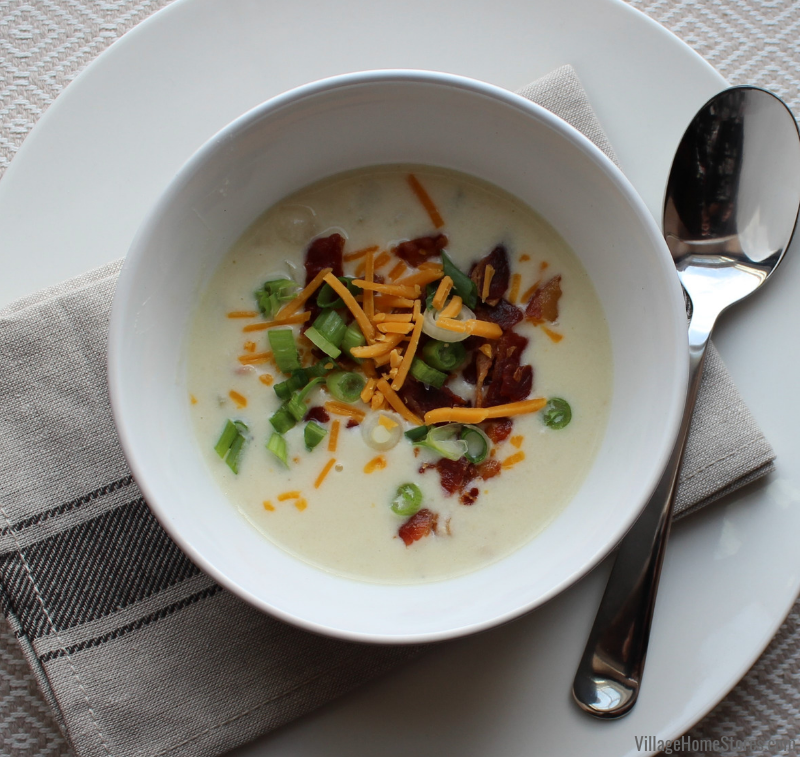 Print off a copy of MaryBeth’s Baked Potato Soup recipe by clicking here. And now for the other incredible entries! 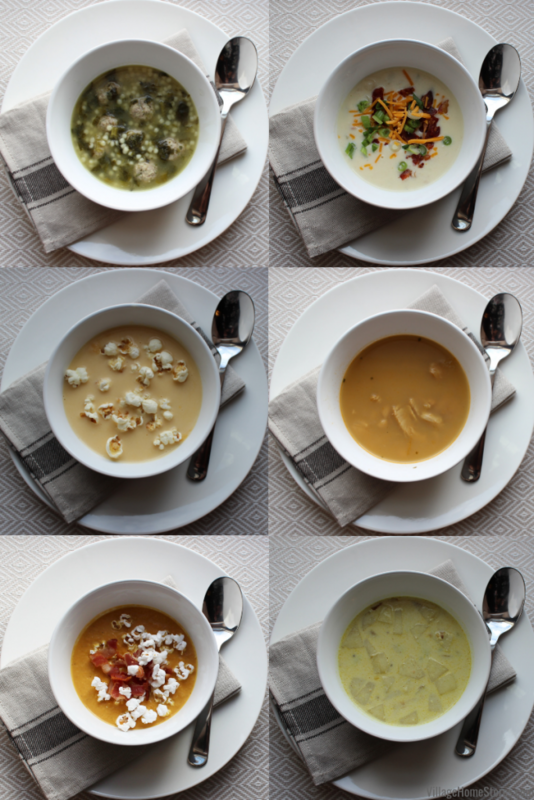 We kinda hope that the party planning committee decides to make this annual event quarterly because we had so many different and creative soups compete this year! 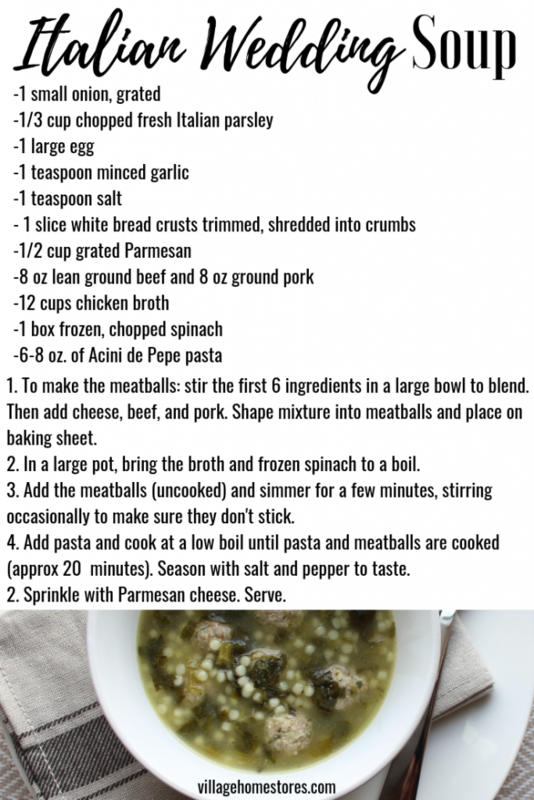 Print off a copy of Angela’s recipe for Italian Wedding Soup by clicking here. 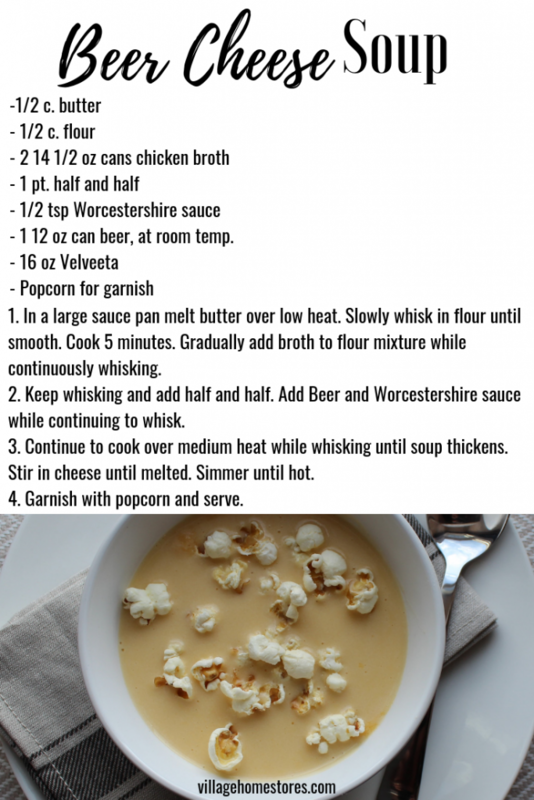 Print off a copy of Rachele’s recipe for popcorn-topped Beer Cheese Soup by clicking here. 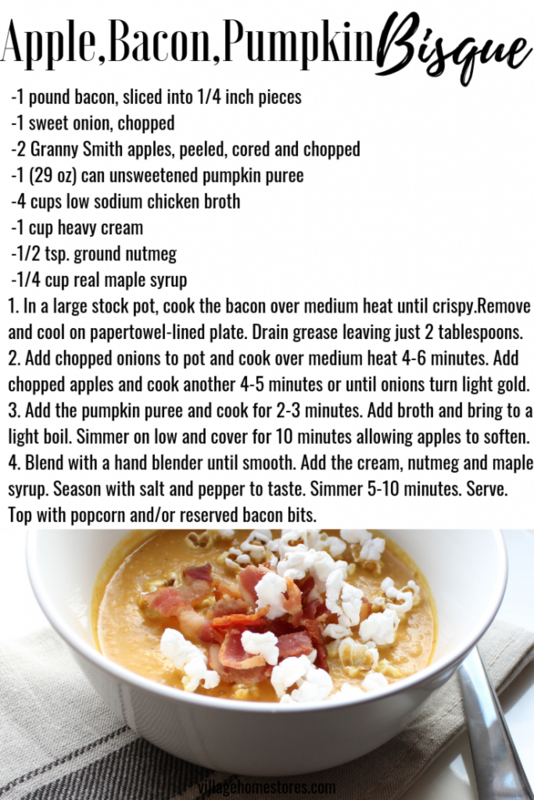 Print off a copy of Elizabeth’s recipe for popcorn and bacon-topped Apple Bacon Pumpkin Bisque by clicking here. 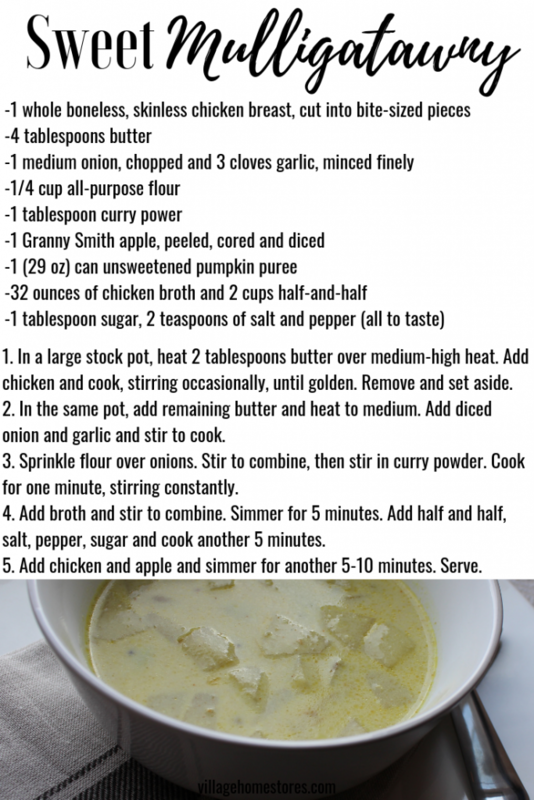 Print off a copy of Gregg’s sweet and spicy recipe for Mulligatawny Soup by clicking here. 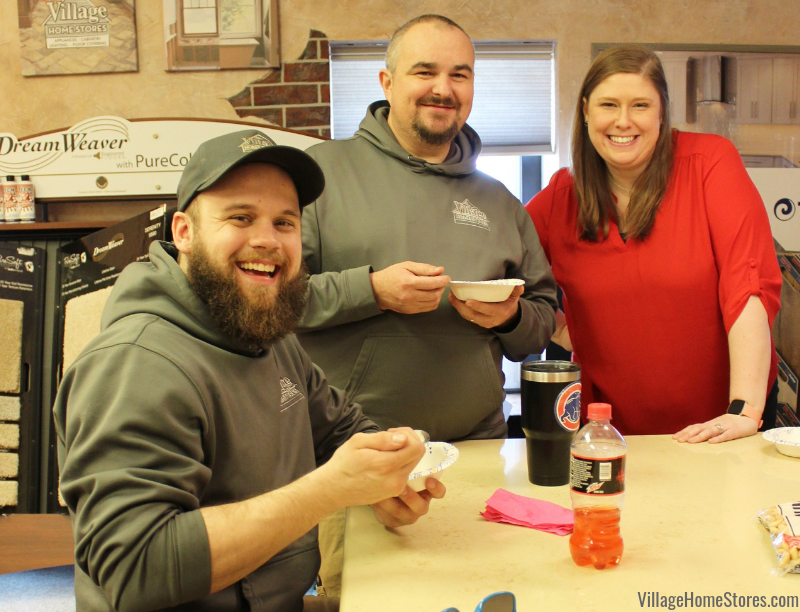 What a fun time and who knew six crock-pots full of soup could feed a Village! Did you find this post because you were looking for a soup recipe? Well allow us to introduce ourselves. 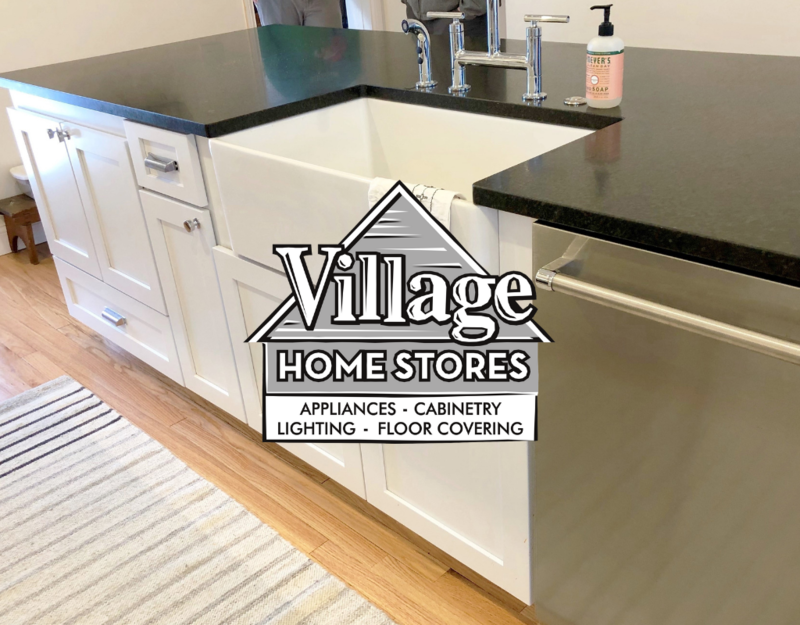 We are Village Home Stores and we are a small business located in downtown Geneseo, Illinois. 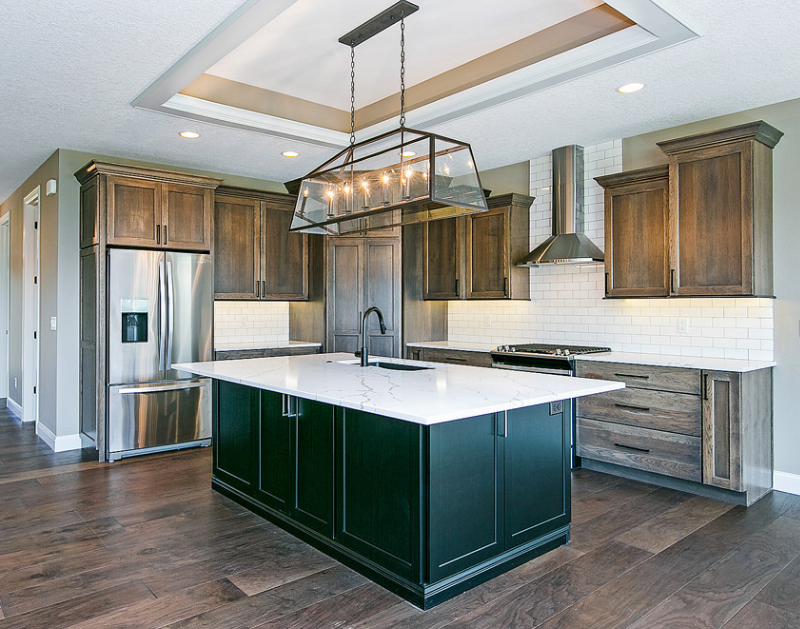 We provide appliance sales, service, cabinetry, countertops, lighting, flooring, wall tile, and custom window treatments for the entire extended Quad Cities Region. 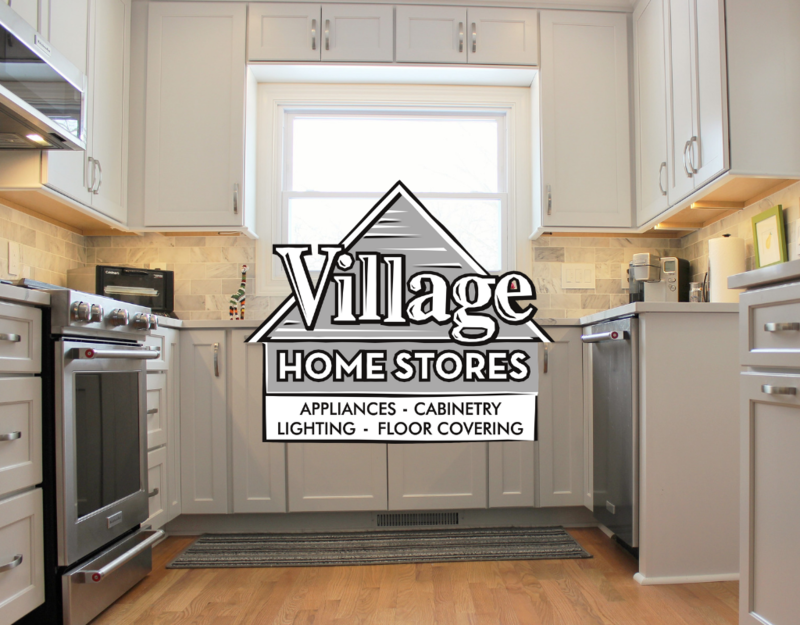 Learn more about our store here at villagehomestores.com or stop by and see us sometime! You may even luck out and show up during a fun event like this soup cook-off! Are you planning a project for your Quad Cities home within the next few years? Are you considering building a new home within the next few years? 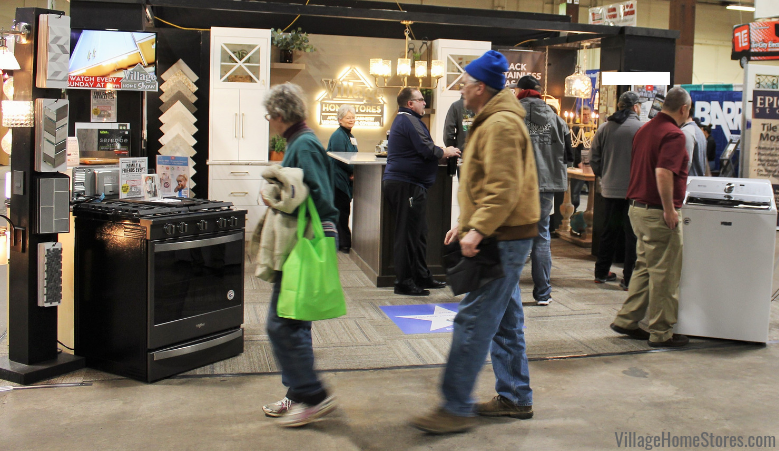 Then we hope you were able to attend the 2019 Quad Cities Builders and Remodelers Home Show this past weekend at the QCCA Expo Center in Downtown Rock Island. 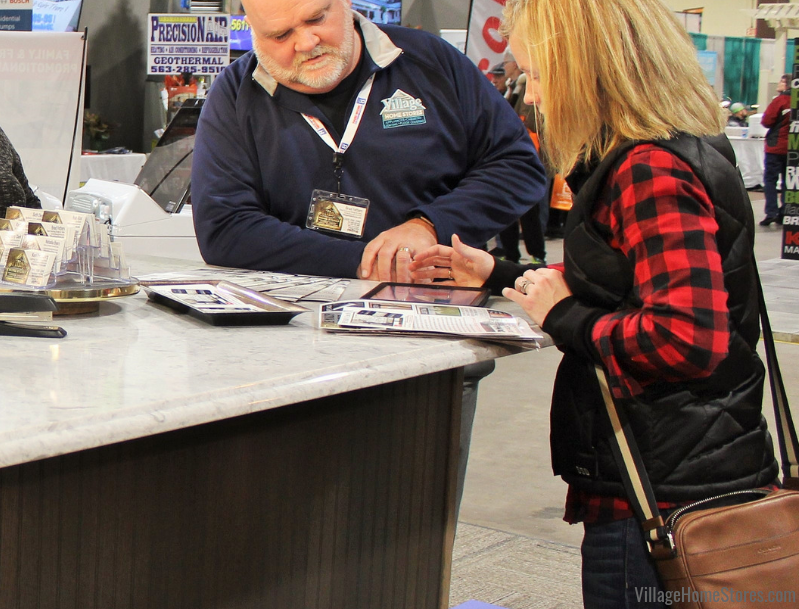 This annual event is your opportunity to browse Quad Cities Area businesses that offer products and services for your home. 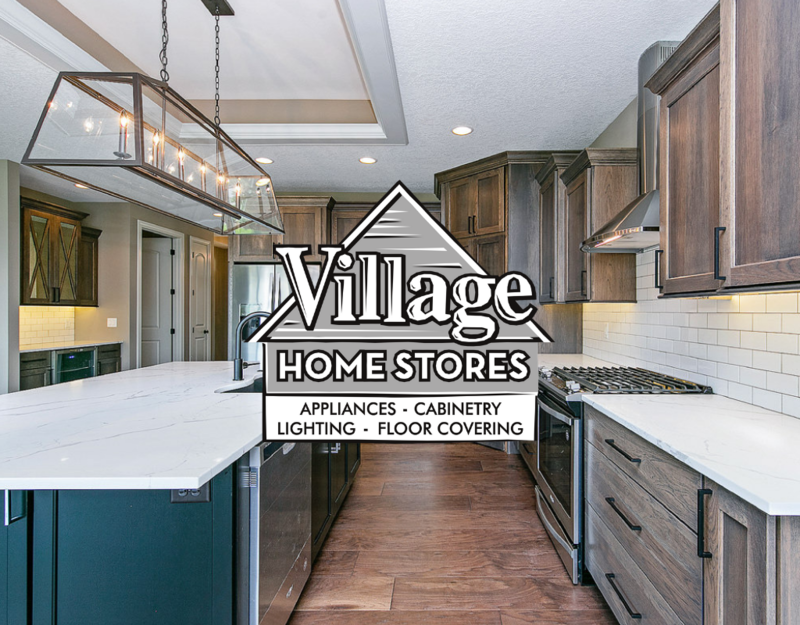 Village Home Stores is a longtime member of the QCBR and we had an absolute blast this year meeting new customers and answering their questions about our store and what it is like to work with us as they visited our booth. 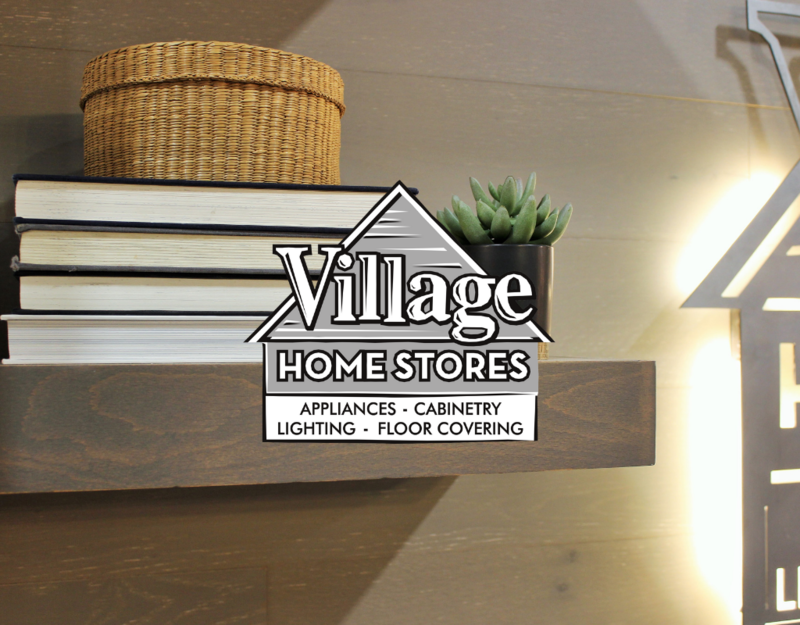 If you aren’t familiar with Village Home Stores, we are a locally owned one-stop-shop home store with many categories of products and services all from one store. We offer Appliances, Appliance Service, Lighting, Cabinetry, Countertops, Hardware, Flooring, Wall Tile, Window Treatments and so much more! If you have seen our weekly TV Show you also know that we offer complete kitchen and bath remodels managed from start to finish. We had staff and products on hand from all departments to help illustrate all that we can do. In our 2019 booth we introduced a brand new full-access cabinet line named WynnBrooke. We are very excited to roll out this new option for our customers and this “Frost” White display will soon be installed in our conference room at the store. You can learn more about this cabinet line here on their website. We also showcased some DIY stick-on wall planks installed in our booth. This great product that can be used for so many fun projects. 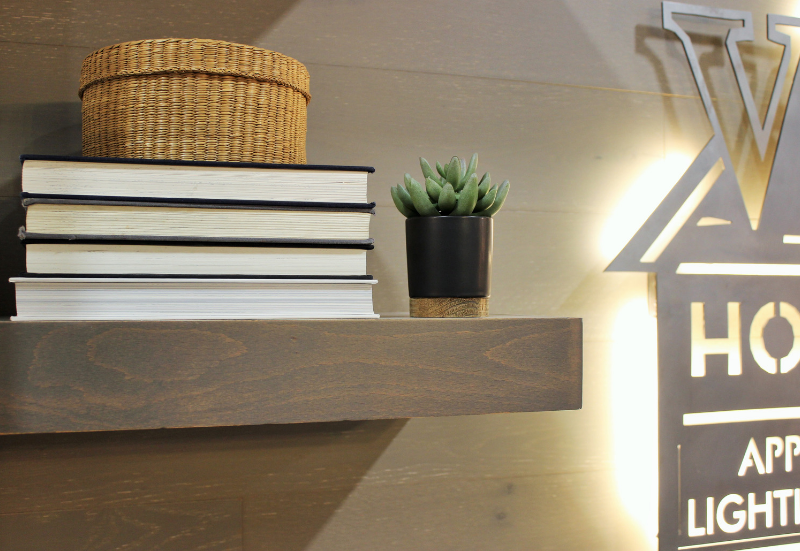 We covered the back wall surface of our booth in the “Pewter” wall plank adding floating shelves and our LED back-lit sign. 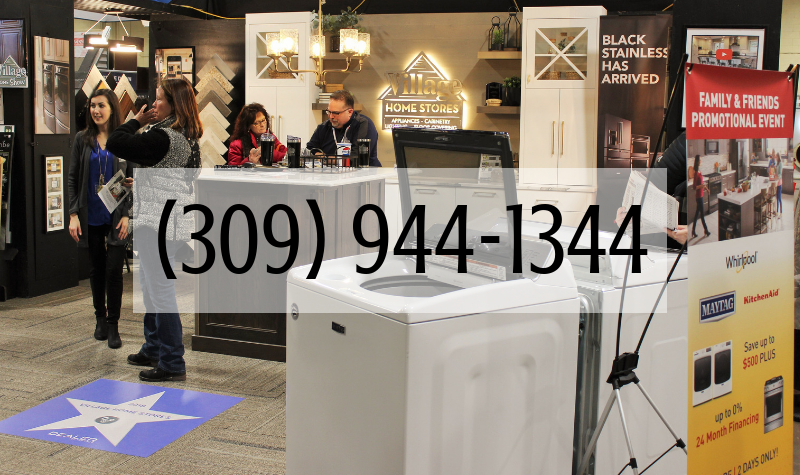 Our Home Show booth included new and exciting product launches like the connected appliances Whirlpool has introduced recently. What is a “connected range” and how can voice commands and scan-to-cook features make your life easier? We would LOVE to answer those questions for you. The Black Stainless connected range we brought to the home show is now back in our appliance showroom. Our expert sales team will explain all of the great features and benefits these “smart” appliances have to offer. 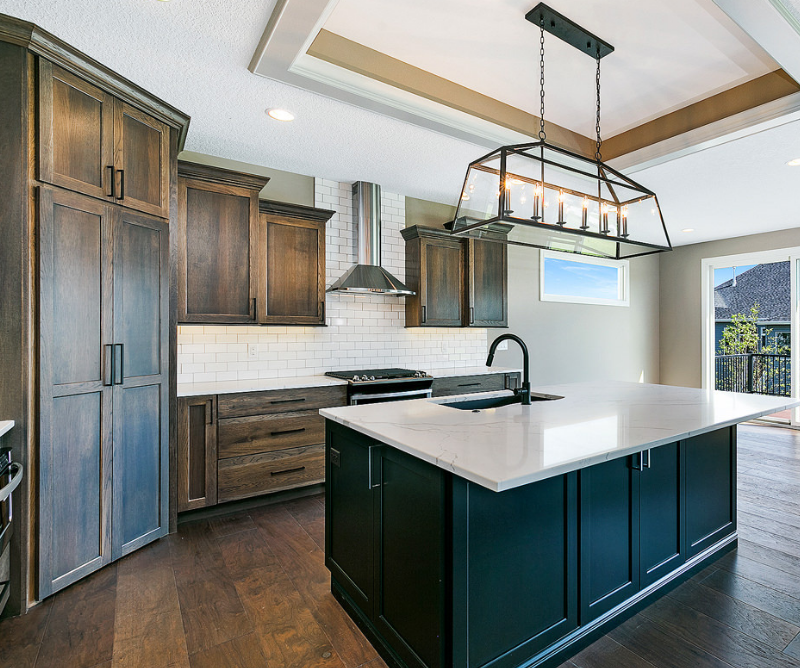 This year we installed a lighting grouping that focused on some of the current trends we are seeing in finish and style. 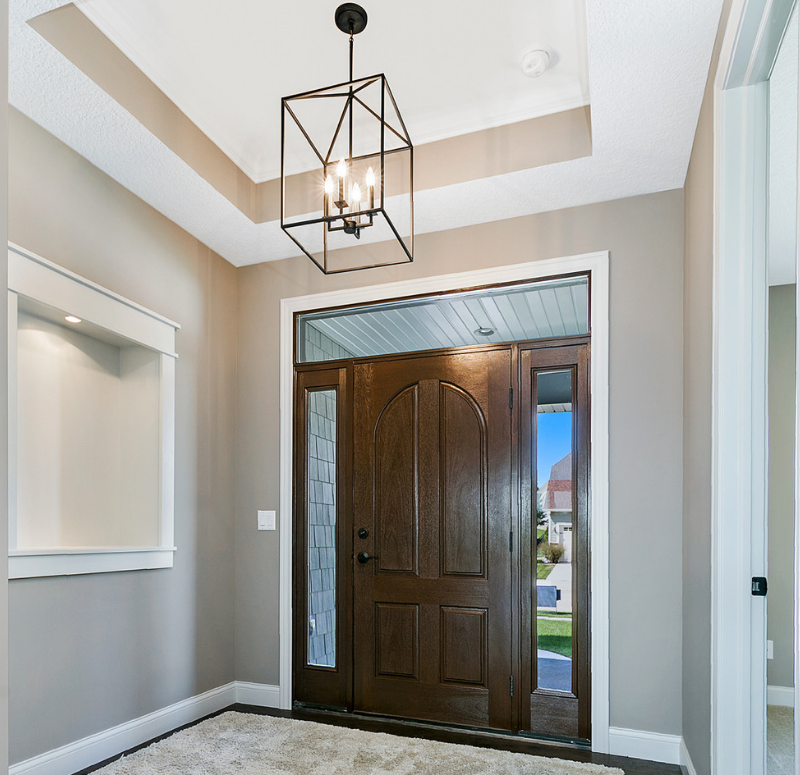 “Gold” finishes are definately back in style but the new take on this trend is subtle, brushed, and can be blended with other metals and finishes well. 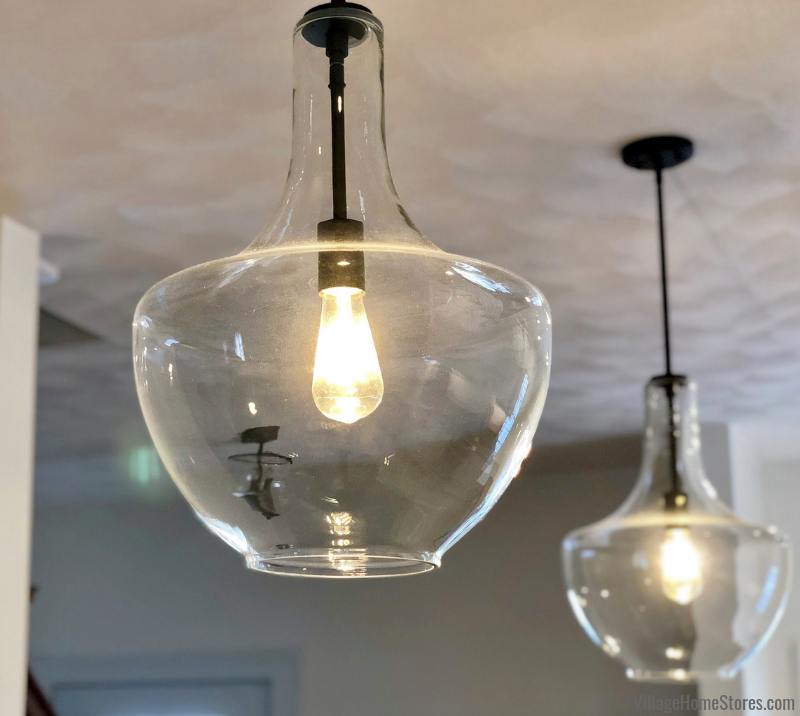 We have seen lighting trends shift from a Farmhouse style into a more Coastal look. 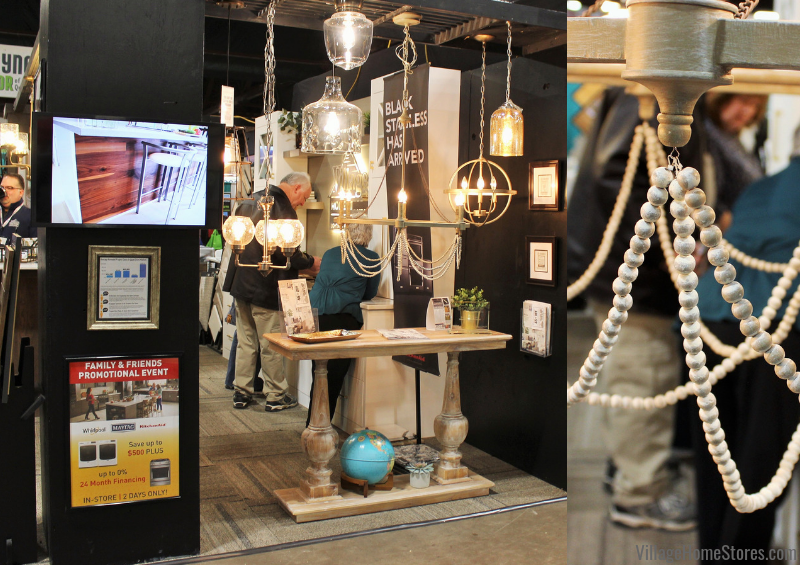 We had a lot of interest in the weathered, wooden-beaded chandelier from our booth. 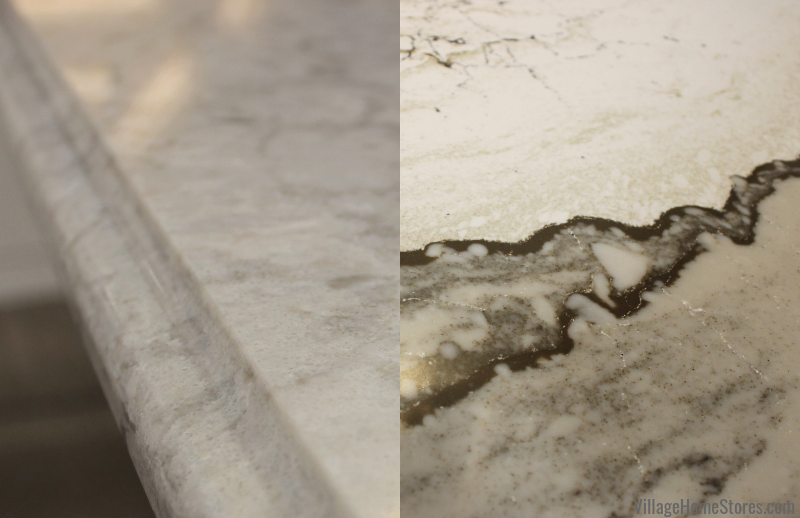 We included two engineered quartz countertops in our cabinet displays this year. 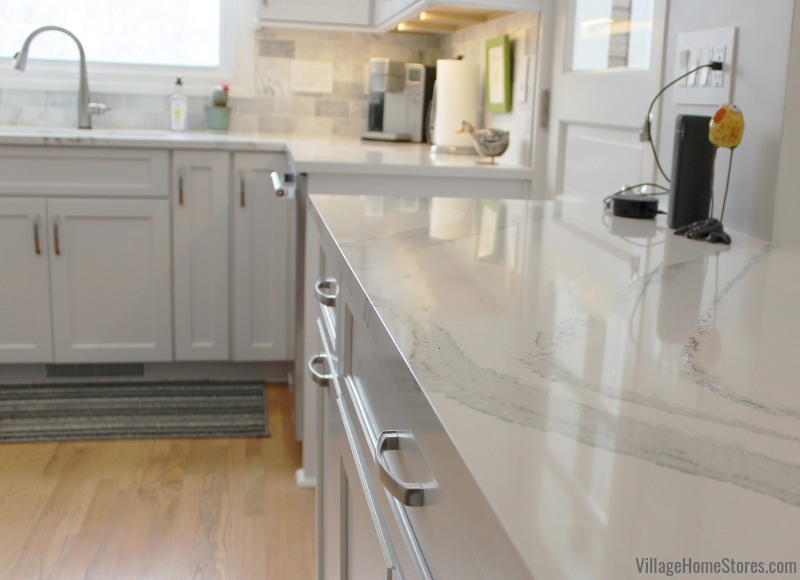 We answered so many questions about countertop surfaces and their differences from guests who visited us. 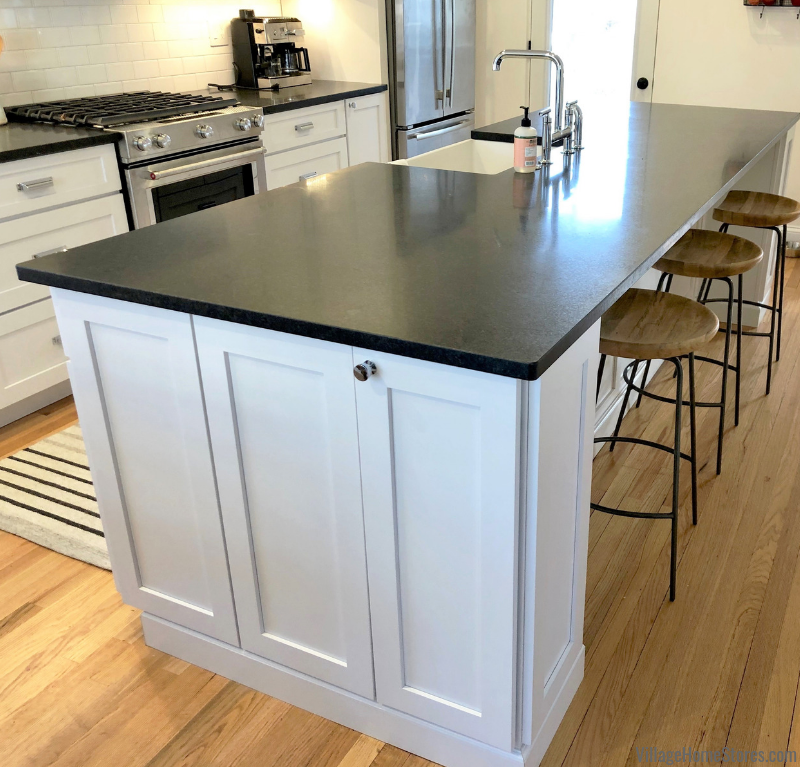 The large kitchen island we displayed included one of our promotional-priced quartz surfaces named “Rolling Fog” (shown below on left with Ogee Edge). 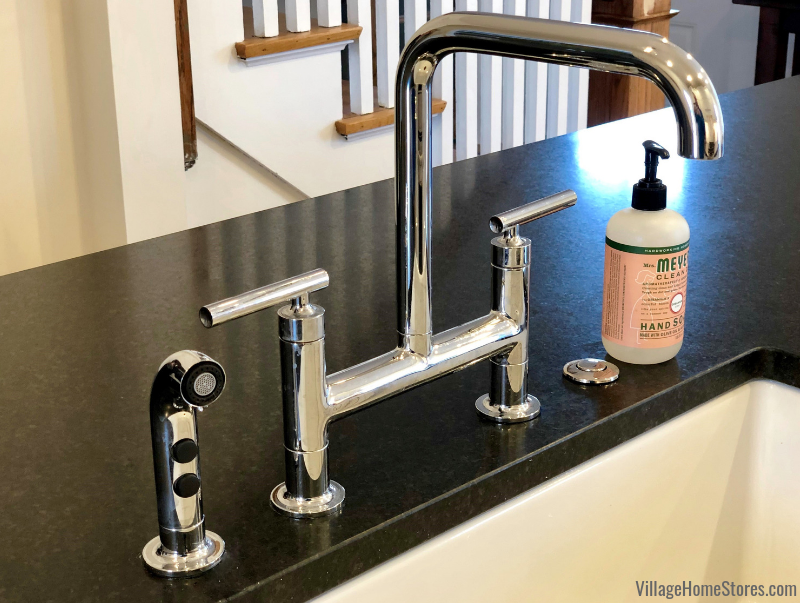 Learn more about our 2019 Quartz promotion here in a past blog post. The back wall of our booth had a stunning statement quartz surface from our Cambria Quartz line. The Skara Brae design (shown above on right) blends on-trend grays and whites in an innovative natural-stone lookalike pattern. 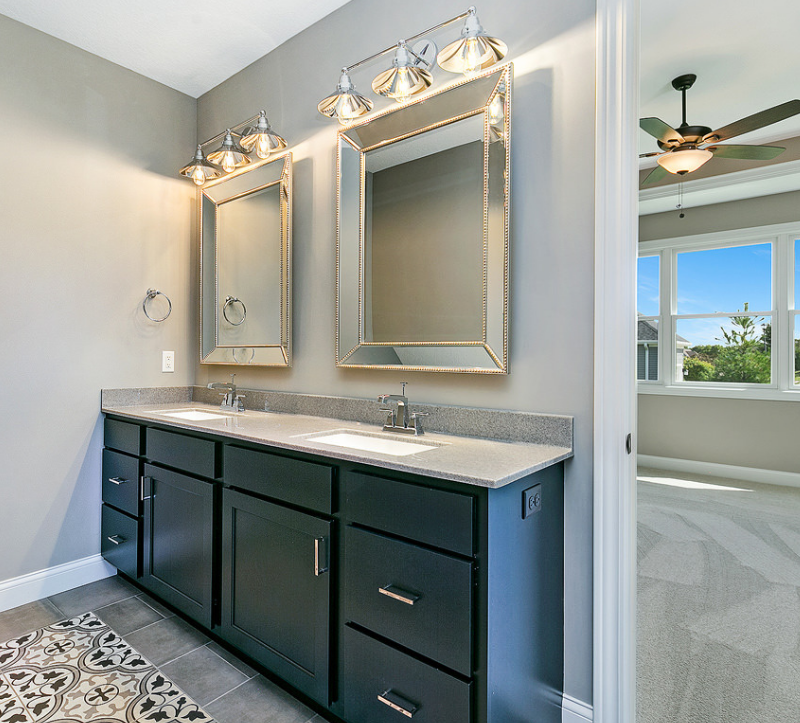 This series of quartz from Cambria offers you the look of a marble pattern with the maintenance-free piece of mind you get by investing in quartz surfaces. Be sure to visit the QCBR website here to learn more about the Home Show event and upcoming Spring and Fall Parade of Homes. 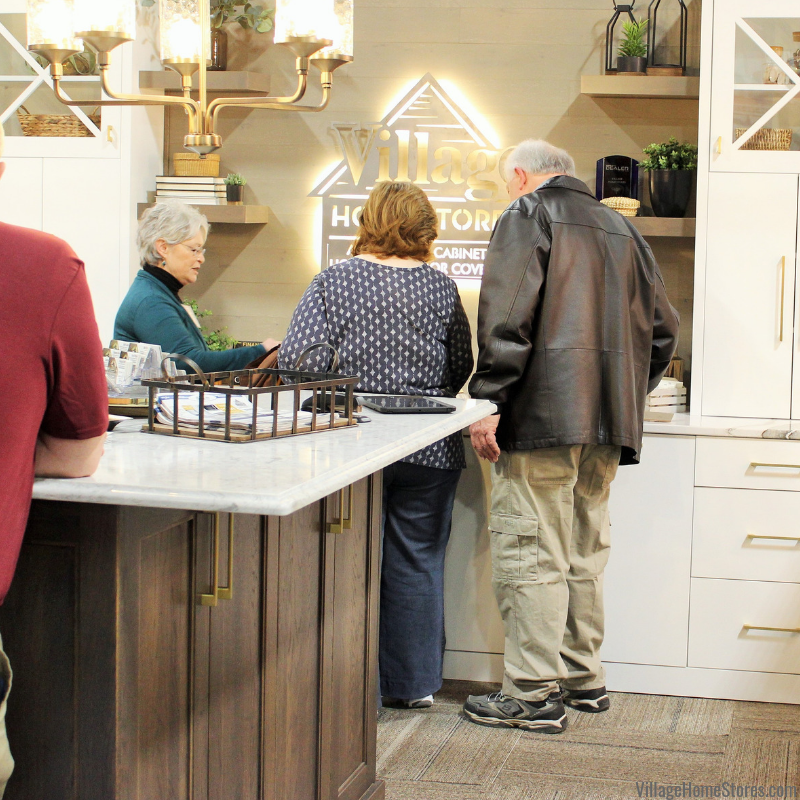 We hope that we had a chance to meet you this weekend but if you missed the Home Show, you can just come see us at our showroom! Village Home Stores is located at 105 S State in Downtown Geneseo, IL. Our hours are M-F 9am-5pm and on Saturdays we are open from 9am-noon. Our design staff can also meet with you by appointment if you just contact us by completing this short online form.